Grand Cru - Aged in Oak Barrels - Old Vines. 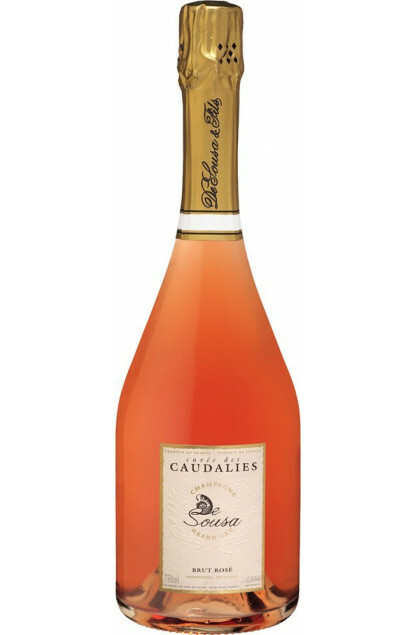 From a ten hectares vineyard of 45 years old, and under the careful attention of a third generation of a Champagne family, this great Grand Cru Rosé is composed of 90% Chardonnay and 10% Pinot Noir and aged for 6 months to 1 year in small barrels. The color is salmon pink and the nose is deliciously seductive offering fine woody and vanilla fragrances with some hazelnut and toasted bread, all balanced with flavors of red berries. An aperitive Champagne with seafood but also with starters such as poached or grilled sea bass. Avize, classified Grand Cru, is a land blessed by the gods, which gives birth to great Champagnes, especially when the winegrower and cellar master comes with his talent to complete what nature already gave him : Erick de Sousa. Avize is both prestigious and generous : a land located at the heart of the Côte des Blancs, between two areas that are as prestigious : Cramant at the north and Oger at the south. Avize is also a Grand Cru vineyard exclusively, whose surface area is quite small : 263 hectares of Chardonnay variety with 20 ares in Pinot Noir. The vine is remarkably well exposed : east-south-east, this orientation and exposure being an essential criteria for the grape’s quality and their sanitary state during the whole maturation process. The soil is entirely chalk, known to be Champagne’s best chalk, which contributes to a perfect draining for the vineyard. This unique setting avoids Chlorosis for the vine (water damage to the vine cause by stagnant humidity). The De Sousa House is precisely settled in Avize since the 1950s when Antoine de Sousa, son of Portuguese immigrants, wed Zoémie Bonville, from a family of winegrowers set in Avize for several generations. Since 1986, Erick, their son, is at the head of their vineyard, a treasure he will transmit to his three children, Charlotte, Julie, and Valentin. The vines in this vineyard are on average 50 years old, which gives to the grape a wide range of aromas and a great concentration. Vintages are vinified in barrels.